These pads are based on the original Mark I pads. For two reasons they are qualified for this modification: The solid plywood plate can carry the shell/head construction taken from a cheap 10" tom, and all modifications can be reversed (this is addressed to all who hate me for what I have done with these vintage babies...). 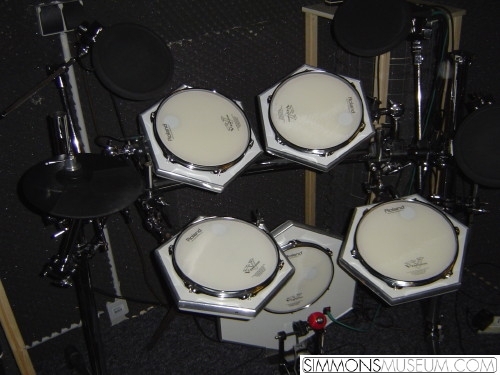 The result is a set of pads with dynamic qualities only provided by high price products like Roland Mesh pads e.g.. The heads are of course tunable. Personally I use this set in a studio production environment triggering a Toontrack Superior plugin, but of course these pads work with everything which processes trigger pulses.